In the market for a brand new, shiny, smart TV? The good news is that there’s more excellent choices out there than ever; the bad news is that working your way through all the options can take up precious time you could be spending binge-watching Westworld. Let us ease your purchasing headaches and point out what to look for. We should warn you at the outset that prices and available models fluctuate wildly, even week to week—with new TVs hitting the market regularly and older ones sticking around for a long while, taking a look on a site like Amazon can be a bewildering experience. The TV makers don’t help, with bizarre-sounding model numbers that don’t tell you much about the technology included, long lists of specifications without any apparent relevance, and multiple versions of the same set that vary between stores and countries. The best way to start is not by browsing the TVs on sale right now, but by thinking about what you want from your next set. First of all, how big do you want this set to be? You need to think about the size of your room and the space for the TV, but also how far away you’re going to be sitting—splurging on a 70-inch set that you’re going to sit four feet away from just isn’t worth it, nor is dropping thousands on a 4K set you’ll be sitting fifteen feet away from (4K loses many of its benefits at distances further than ten feet). We’re seeing a new measurement make its mark too: thinness. If you notice a high markup on a modern set then its thinness might be one reason why, but you only really need to go ultra-thin if you’re planning to wall mount your set, otherwise a bit of heft in the depth department can add some handy extra stability. The “best” size for you depends on your own tastes and situation, but mocking up a cardboard frame for the sort of dimensions you’re considering is one way of gauging just how much of your living room your next set is going to dominate. Bigger is usually better, but within reason, and you’ll have a budget to think about too. As for resolutions, 4K (or Ultra HD) is pretty much a no-brainer at this point, though if you’re going for a smaller size (say around 40 inches or less) then you can save yourself some money by going for an older HD-only model—that 4K res won’t really be noticeable on smaller screens anyway. Speaking of differences you can actually notice, 8K is on the horizon, but it’s debatable whether living room TVs will ever get big enough for 8K to be worth it, and the tech is still some way off at the moment—you certainly shouldn’t hold back on a 4K purchase because you think it’s going to be made obsolete anytime soon. Meanwhile 4K content is slowly but surely making its way out there, and the trend is only going to accelerate in the future, so it’s worth future-proofing your purchase unless you really are trying to save the pennies. Have a think about how many inputs you need as well—you want all of your consoles, Apple TVs, cable boxes, and Chromecasts to have room to fit. Checking the HDMI spec is important too (it’s usually found in the manual for the TV), because HDMI 1.4 is limited to 4K at 30 frames-per-second, and you need HDMI 2.0 or higher for 60fps 4K, and HDMI 2.0a or later for full HDR support. Most new TVs will support the newest standards, but it’s something to look out for if you’re going for an older box and want to plug 4K sources into it. There’s a basic choice here between OLED and LED (which, strictly speaking, is actually an LCD lit by LED), but on top of that choice you’re going to come across a host of acronyms and terms the TV makers have dreamt up to identify their own proprietary technologies and display tweaks. Like pretty much everything else in the TV industry, the OLED vs LED battle is developing all the time. The truth is that both types of tech can give you a brilliant-looking picture, and to some extent it doesn’t really matter which one you opt for, as long as you’ve got a display that meets your expectations and is good value for what you paid. If you do want to know the differences though, OLED typically offers deeper blacks, better contrast, and a superior overall picture, but it’s also usually a lot more expensive. 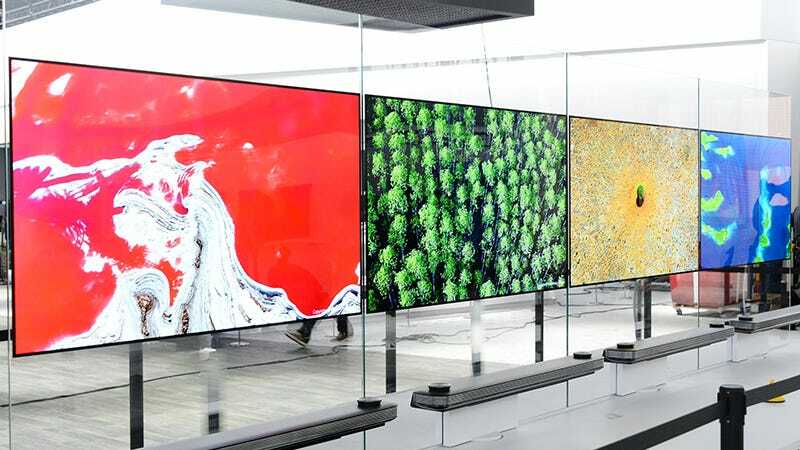 Saying OLED is broadly better than LCD is not the same as saying every OLED set is a better value buy than every LCD one—you still need to look closely at specs, performance, and reviews, as well as that all-important price. HDR (High Dynamic Range) is perhaps the must-have tech, alongside 4K, in your next set—it offers an improved range of colors and brightness, plus better calibrated contrast, and makes pretty much any picture better. It’s not just as easy as picking a set with HDR though, because there are competing standards to consider: HDR10, which is a very basic version found in HDR content from Netflix and Amazon, Dolby Vision, developed by Dolby and “future-proof”, and Hybrid-Log Gamma, a brand new standard created in tandem by the BBC and NHK and intended for broadcast use. What the Hell Is HDR? Which is “best”? On paper, Dolby Vision sets a higher bar than HDR10 or HLG, but any one of those three labels on your new set should mean a better picture. Some sets can even handle all three, so that’s one option if you are struggling to choose between them. With all that to bear in mind it might sound impossible to make a decision on a TV, but try not to get paralyzed by all these details—just be aware of what these technologies and terms are. You can get fantastic-looking TVs from either set of standards, and ultimately it’s only one specification among many. Most of the other specs and acronyms that manufacturers like to throw around can largely be ignored: they’re just fancy names for the special innovations and calibrations each company is making. For you all that matters is the quality of the resulting picture, and you won’t get that from a spec sheet—professional and user reviews are a much better guide. And steer clear from judging by the sample TVs at the store. Those have been calibrated to look best in the harsh light of Costco or Best Buy and won’t accurately represent the picture you get when you put the TV set in your dimly lit living room. As if the Android vs iOS debate wasn’t enough, you now need to pick an operating system for your television set as well. Fortunately, it doesn’t make anywhere near as much of a difference as it does in the smartphone realm. Remember you can always plug in a Roku or Fire TV box —you’re not going to be seriously limited by the software running on your new set with all those HDMI ports to make use of. It’s still a consideration to weigh up though, and these are the leading OSes you’re likely to come across in your travels. Android TV—Android on a TV, obviously. There are a lot of the big-name apps are here, and it’ll be nice and familiar to existing Android users (if you’ve purchased apps for your phone they’ll work with your TV). You also get some nice benefits such as built-in Chromecasting and Android mirroring as well. Firefox OS—another recognizable name but Mozilla has now abandoned Firefox OS on TVs, leaving Panasonic to mop up the mess. Its future may be uncertain but for now it’s a decent, clean TV interface with some big-name apps built in (like Netflix and YouTube). Roku TV—as a built-in OS, Roku hasn’t made much of a dent on the smart TV market yet, but it’s growing in popularity among budget TV makers like Hisense and TCL. It’s certainly polished and packed with apps, as you’ll know if you’ve bought any Roku box before. Tizen OS—Samsung’s own operating system has made its way to television sets too, and it mostly does the job. Amazon Video, Netflix and others have apps and choosing inputs is a super slick affair, but perhaps the most notable selling point is it works well with other Samsung gear, if you’ve got any. WebOS—LG’s smart TV platform of choice looks the part and is speedy in all the right areas. It has all the big names in terms of apps too, from Hulu to Spotify, even if it can be a bit fiddly to customize, and LG seems committed to pumping out regular updates. You can read all the online reviews in the world but nothing compares to actually getting out there and seeing a screen for yourself, so schedule in a visit to your local home theater store to check out the TVs you’re considering in person. Home theater stores will usually have the TVs displayed in optimal living room-like lighting to give you a better grasp of what the set will look like in your own home. Even if they don’t have the exact models you’re interested in, you should be able to weigh up the various merits of the competing tech being pushed by the big manufacturers. That said, online reviews are obviously still important, but you’re probably used to scouring them before parting with any of your money already. Something that helps on a site like Amazon is to read through the middling reviews, rather than the ultra-positive or ultra-negative ones—these will usually give you a good balance of pros and cons. You’ve probably got an idea of how much you want to spend, so you can use this as a quick way of narrowing down your options, while if you want to make sure you’re getting the latest tech then limit your search to models from the last year or two—part of the confusion in picking up a smart TV, especially online, is that there are so many older, but still very capable, sets knocking around. Those older sets are worth having a look at if you want to save some cash though—just check if they’re still getting software updates from the manufacturer. Overall, it’s useful to know the ins and outs of various specs, but don’t let them slow you up too much: focus on size, picture quality, and 4K and HDR within your budget, and you should find the choice is much more straightforward than you first thought.